KLM Royal Dutch Airlines on June 14, 2016 introduced its unique orange-colored Boeing 777-300 (777-306 ER PH-BVA, msn 35671). The well-known KLM Blue is being combined with orange highlights. The transition between the two colors features aspects of the Dutch flag. The combination emphasizes KLM’s Dutch roots and pride in the national color of the Netherlands. The introduction of the special aircraft was partly prompted by a social media post KLM published on King’s Day 2015. At the time, KLM’s followers were presented with a picture of an orange aircraft, along with the question: “Should we color orange next year on King’s Day? #OrangeExperience”. 30,000 likes and 2,500 positive responses later, KLM rolls out its only orange aircraft on June 14. KLM will deploy the orange Boeing 777 on routine flights within the network and, whenever possible, during events that offer opportunities to promote the Netherlands. The aircraft will debut this summer and will be in operation on the Rio de Janeiro-Amsterdam route during the Olympic Games. On 22 August, KLM will use its orange Boeing to operate the “Medal Flight” that brings the Dutch Olympic heroes home. 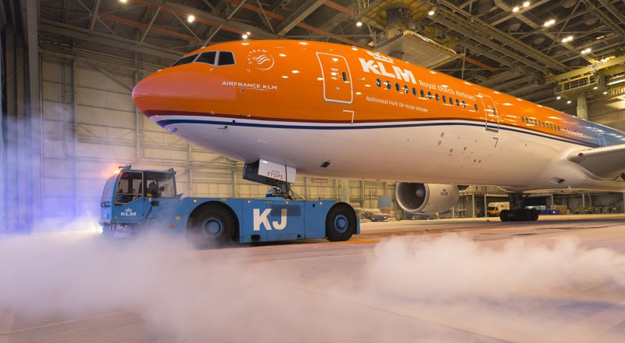 335 liters of paint were used to spray the aircraft orange fading into KLM’s distinctive blue. Applying the colours in multiple, thin layers, requires less paint and the sustainable, chromate-free paint can be easily washed off. The colours of the Dutch flag have been incorporated in the transition between orange and blue, completing the aircraft’s Dutch image. It took a team of 35 people four days to spray on the orange livery.